Some fancy dress parties are more impressive than others and you know you’ve been invited to a posh soiree when the word Masquerade is used; that’s the name and the theme of this online slot machine from Red Tiger and it comes with several bonus features and a progressive jackpot. Masquerade is a five reel slot with variable rows (see the screenshot above) and twenty fixed paylines; amazingly ornate columns support an equally impressive roof piece which come together to border the reels. Gas light illuminates the paths in the background to give a seasonal (and historical) feel. There are four higher value symbols which include the red-haired girl, a gold ring, a pocket watch and a top hat; 10, J, Q, K and A make up the lower values. 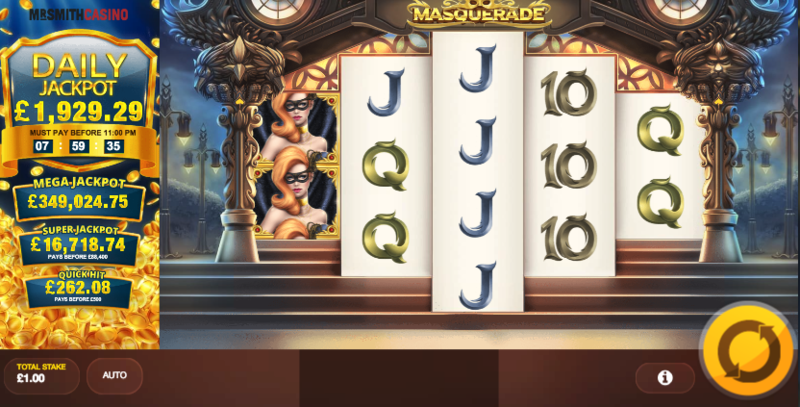 There’s no wild in Masquerade but there are bonus symbols including the Royal Masque, Golden Masque and jackpot icons which we shall explain a bit further down. The Royal Masque is a huge symbol which can cover reels two, three and four completely and when it does it will rotate and transform into one of the standard symbols for a guaranteed win. This is a normal sized bonus symbol but when it lands it will spin to reveal one of the standard symbols; if you’re lucky it will then duplicate itself to adjacent symbols for a better chance of a decent win. This is triggered from the base game by landing three of the jackpot symbols which will either the Mega, Super or Quick Hit prizes shown to the left of the reels. There’s also a Daily Jackpot which must pay out before the time shown. Red Tiger games tend to be based on a similar template and Masquerade is too but it comes with an interesting payline structure and it’s good fun; the graphics and animations are intricate and of a high quality and of course there’s the progressive jackpot to reach for – it comes with an RTP of 95.11%.